Make a plan for more effective gym-based workouts. The gym can be pretty intimidating, especially if you're a total newbie. After seeing the muscle heads lifting weights over by the dumbbells and the uber-svelte fitness elite logging miles on the treadmill, you may not know where to start. However, your gym visits will get a little more manageable -- and a lot more effective -- when you use a workout chart. It will help you plan your workouts so there's less time spent wandering around and wondering where to go or what to do next. Before you line up your chart, you'll need to choose exercises that you plan on doing at the gym. 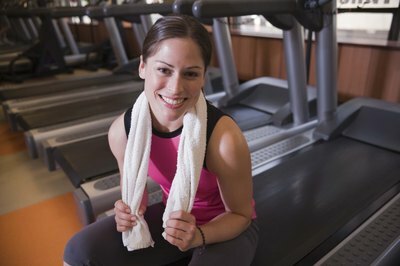 You should do cardio exercise up 30 minutes per day at least five days a week. So. add to your list running, dancing, stationary biking, swimming or any other activity that gets your heart rate up. Strength training can then be added three times weekly to fill in your chart. 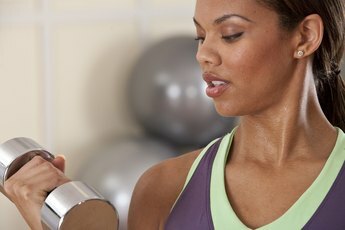 List the exercises that you plan on doing -- both for cardio and strength training -- on separate lines on your chart. Part of the fun of keeping an exercise chart is monitoring your progress. Next to each of the different types of exercises on your chart, add spaces for the specs. You'll want to jot down information such as the amount of weight you lifted, how many reps and sets you did, the machine settings you used, the length of time you exercised, and even your heart rate after you were done. While the results might not be pretty the first time around, tracking the progress you make is worth sticking to your chart for the long term. Part of your workout chart should be dedicated to pre- and post-workout snacking. Since you are what you eat, you'll definitely want to chew on complex carbs for long-lasting energy before your workouts and nosh on lean protein to help rebuild muscle tissue after workouts. Plan what you'll eat so you have the right snacks on hand and you don't get totally distracted by the vending machine at the gym. Okay, so you have your chart prepped and ready -- now what? Bring your workout chart with you to the gym and fill it out as you go. Since you'll have all of the specs and stats handy, it'll be easier to track your workouts as you do them. Pop it in a binder and carry it around with you. Soon, you'll start seeing slight improvements in your stamina and strength, which can help motivate you to try even harder the next time or dial up the resistance on your favorite weight machine for a bigger challenge. However you use it, a workout chart spells success for a gym newbie like you.